Six of the seven last quarter goals have been generated from stoppages. Swans InterchangeHeath Grundy off due to the blood rule. 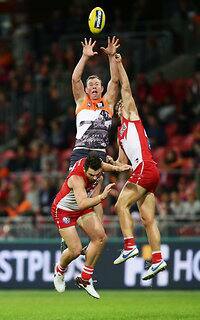 Steve Johnson has seven clearances which is his highest amount since round 16 2014. The Giants have launched 51 points from the attacking midfield, throughout 2016 they have averaged 29.2 points launched in the attacking midfield. The ball has been in the Giants' forward half for 64 per cent of the last quarter. The Giants lead ball up clearances 18 to four, however the Swans lead throw in clearances 11 to six and centre clearances 10 to five. Swans InterchangeCallum Mills off due to an injury. 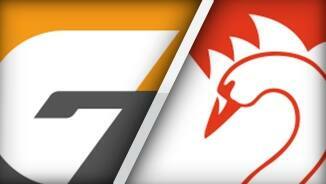 GWS has kicked 7.10(52) launched from a Swans' turnover. The Giants average a differential of plus 12 points from this source and today they are plus 30. 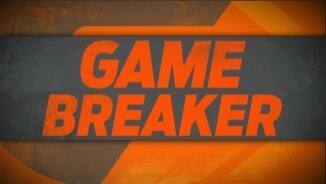 Greater Western Sydney lead third quarter contested possessions 24 to 11. 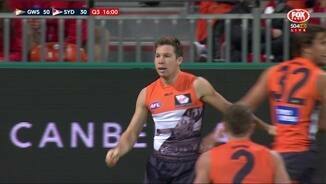 Both of the Giants third term goals were a result of a forward half intercept. Following the same trend as the first and second quarters, the Giants have had the first five inside 50s of the third term. 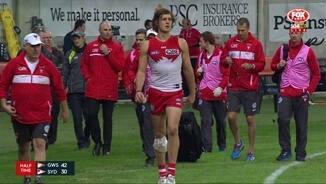 Swans InterchangeKurt Tippett and is possibly out for the game. Greater Western Sydney has kicked three goals from chains starting in the attacking midfield, they have averaged 4.4 goals per game in 2016. The Giants lead effective clearances 12 to six. After the Giants had the first eight inside 50s of the term, the Swans have had the next six. Like the first quarter, the Giants have started the second quarter with the first five inside 50s. The Giants have converted all eight of chains starting in the attacking midfield to inside 50s and three of them to scores. The Swans are yet to register a clearance from a ball up and the Giants have five. The Swans have kicked their opening two goals form a Giants' turnover, they are ranked fifth for points from this source. Greater Western Sydney has had a fast start to the game, it leads inside 50s seven to one clearances four to one and contested possessions 12 to seven. The Giants have had the first five inside 50s of the game. Greater Western Sydney has generated an inside 50 from 27 per cent of kick ins this season, ranked second. The Swans are ranked first for long kicks, averaging 69.4 per game and they are ranked last for short kicks, averaging 61.5 per game. Welcome to Spotless Stadium for the GWS Giants v Sydney Swans Round 12 clash. 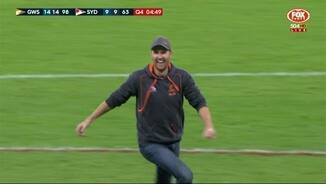 GREATER Western Sydney have shown they are ready to hang with the AFL big dogs after celebrating their 100th game with a 42-point-win over local rivals, the Sydney Swans. A surge either side of half-time set up a 15.15 (105) to 9.9 (63) victory, just their second win in 10 Sydney derbies. The result on Sunday at Spotless Stadium snapped the Giants' two-match losing skid and a three-match Swans' winning streak. A win would have put the Swans top, but they were second-best for most of the game, which was viewed by a crowd of 21,541, a record for a sporting fixture at the ground since its redevelopment. The Giants won the midfield battle and got more drive out of defence through Brett Kirk medallist Heath Shaw, Zac Williams and Nathan Wilson. Toby Greene booted four goals in the victory and Giants coach Leon Cameron was impressed with how the former midfielder had re-invented himself. "I'm pretty hard on Toby (Greene) because I know the ability he has," Cameron said. "He's into his fifth year so we're expecting him to back up every week. "When he stays tuned in with the game he can deliver results like he did today. "He's gone back an re-invented himself as a small forward, he wins one on one footy and guys like that in your team are absolutely valuable." From a 23-23 tie early in the second quarter, the Giants kicked seven of the next eight goals to lead by 40 points. After quiet first halves, both Josh Kennedy and Lance Franklin lifted and got the Swans back into the game as the visitors notched the last three goals and 20 points of the third quarter to cut the deficit by 20 at the last change. 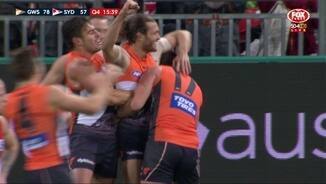 However the Swans couldn't get the deficit below 20 in a final term in which the Giants' Sam Reid marked his first game in over 1000 days with a goal. 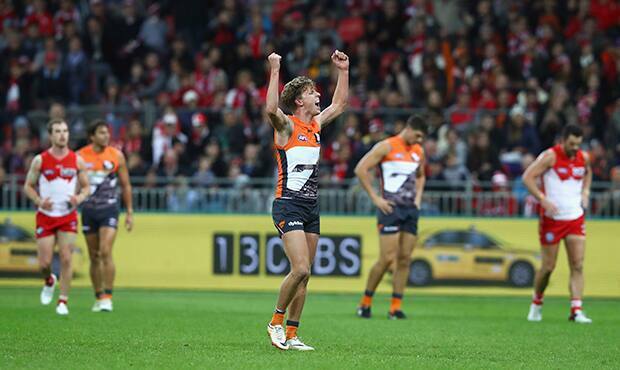 GWS finished 20-up in contested possessions, had 49 more disposals and had nine more inside 50s. The Swans were hit by injuries to two in-form players, with Kurt Tippett leaving the field in the second quarter and speedster Gary Rohan sitting out the final quarter. 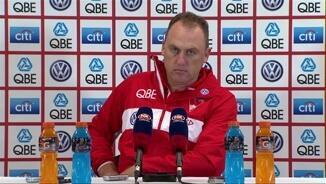 Coach John Longmire said post-match that the immediate future didn't look good for his ruckman. 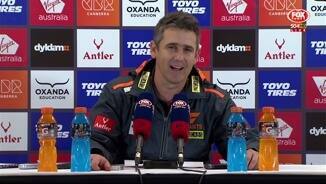 "It's a hamstring behind the knee, so I think it's going to be a significant one," he said. "We don't know (how bad the injury is); that's as much as we know at the moment. "We haven't got him scanned yet so we won't know until tomorrow (Monday)." 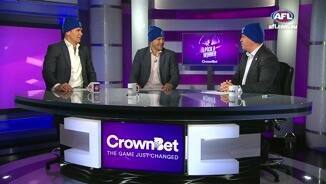 Greater Western Sydney: The Giants look to have come through the tough match unscathed. Sydney Swans: Ruckman Kurt Tippett played no part in the second half after suffering a hamstring tendon injury late in the second quarter. Coach John Longmire confirmed Tippett's injury was "significant" and that he was set for scans on Monday to determine how long he will be out for. Gary Rohan missed the last term as his corked glute bled into his hamstring, and young guns Callum Mills (throat) and Isaac Heeney (shoulder) also copped knocks. The Giants head to Melbourne for another Sunday twilight game against Essendon at Etihad Stadium, while the Swans also play Sunday, taking on Melbourne at the SCG.